Comment: Now, could we please stop talking about how we need more taxes to pay for roads and bridges or to help the poor? The main function of our government is to write checks to middle-class and wealthy voters. And that's the reason its finances are in the toilet. This means Elizabeth Warren, for example, who said a factory owner needs to pay more taxes because "you moved your goods to market on the roads the rest of us paid for; you hired workers the rest of us paid to educate; you were safe in your factory because of police forces and fire forces that the rest of us paid for." Answer: you paid for that long ago. That's not where the money is going. This means Robert Frank, whose NYT "Economics view" argued for "higher taxes needed for improved infrastructure" and claimed "when the anti-tax wealthy make campaign contributions, they are buying only the deeper potholes and dirtier air that inevitably result when tax revenue is low." No, that's not where the money is going either. The point, today, is not whether these checks are a good idea. The point is just this: let's argue honestly about the actual issue. Ms Warren, Mr. Frank, and company: argue wholeheartedly that you want higher taxes to keep the checks coming and write more of them. Opponents: argue the opposite. But leave the roads, bridges, the poor and the environment out of the debate over higher taxes. Nor am I being heartless. I think we should be doing more to help the genuinely poor, especially the mentally ill that wander the streets of Chicago. I like roads and bridges as much as the next guy (though I must note that building more highways is a very recent liberal priority!) But these priorties are just irrelevant to the current taxation and spending debate. PS. Of course the Times article was trying to make the opposite point -- that all these middle-class recipients of government largesse were being silly for not supporting politicians who promised to give them more money. The idea that these hearty middle class people were actually smarter than Times writers, and saw that the system would soon break down, did not occur to the Times. 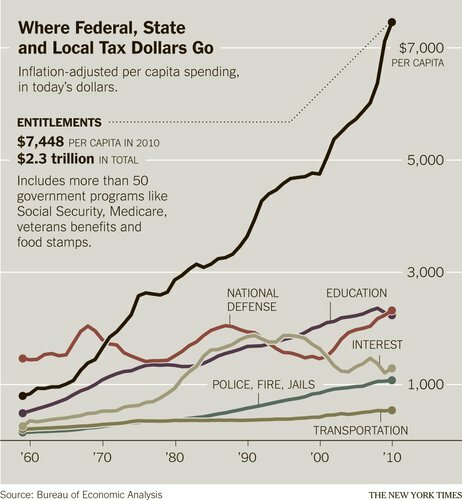 I see that the "entitlement" category on the NYT graph includes some government spending focusing on the poor (such as food stamps, and, I assume, Medicaid). I also notice that the graph explaining the distribution of government payments ends around what looks like 2008, before the recession really took a toll on government finances. People like Paul Krugman explain the massive increase in government spending over the past 4 years as the result of increased safety net spending, and would presumably take a different view than you do about whether increases in per capita government spending are directed at the poor vs. the middle class. How would you respond to that argument? The graph ends in 2010 - post stimulus. I don't understand what your question is. Also, Krugman would argue that we should just increase government transfers to match the dip in spending consumers were consuming at pre-recession - just push Aggregate Demand back to it equilibrium before the recession. And doing more now would probably crowd out private investment (which is the crux of the matter here, which is the willingness of people to start lending again). I thought that this post was not about macroeconomic stabilization of the economy, but rather why exactly government spending is rising at such a fast rate, and whether liberals' explanation is accurate or not. There are two graphs here, one showing per capita government spending (which ends in 2010, and shows a substantial spike in entitlements), and one showing where that spending is distributed. It's the second graph that looks to me ends in 2008, and so leaves me wondering which income quintiles are most affected by the increased government spending of the last 4 years. While I agree with Prof. Cochrane that statements like Elizabeth Warren's are silly - no, we aren't seeing massive increases in spending on education, infrastructure, or public safety, so those can't be the justification for tax hikes. My only question is whether we can get a clearer view of the distribution of government transfer payments post-2008. Granted, I agree with Prof. Cochrane that long term fiscal problems are a matter of "writing checks to middle-class and wealthy voters." @Sam - While we aren't seeing an increase in spending on "education, infrastructure, or public safety" are we seeing a decrease in those areas due to the funding constraints imposed by the entitlement programs? Specifically medicare and social security that are paid to everyone regardless of their poverty status? @John - Also in the article you mention that the readers are smarter than the Times - but that still doesn't suggest they are being smart; now when you look at their perceptions regarding what they put into Social Security and Medicare and what they can expect to get out OR in their denial that Medicare alone is a huge burden on our budget each year that needs to be addressed (via either reduction in benefits (or beneficiaries) or via an increase in taxes to fund maintaining those benefits). Government spending and transfers, rather. If you are enamored by some undetermined idyllic point in the past (as so many on the left seem to be), I don't see how these two graphs get you to the conclusion that what we need right now is tax increases. In fact, I would think the opposite conclusion is the more obvious one. Sure, lets go back to 1979 when real per-capita government spending was at 1/2 its current level. Need to do it by taking goodies away from the middle/upper classes? Fine. Like we need government picking one of our pockets just to put it back (minus overhead, of course) into the other. I am all for an honest debate. To move in that direction, the Tea Party and the Republican Party need to forthrightly say that when they are talking about government bloat and the need to cut spending they are talking primarily about Social Security and Medicare for the middle class and medicaid for the poor and veteran's benefits. When Canada moved to balance its budget in 1995 the Minister of Finance made it clear that a significant part of the cuts would fall on the health care system. That would not be an honest debate. An honest debate would be that we need cuts everywhere. Absolutely everywhere, and in all parts of government. For the entitlement programs we also need a mechanism so that they do not automatically rise in cost with each successive year. If the spending is primarily on middle class entitlements then the cuts that the Republicans and the Tea Party are talking about have to fall primarily on middle class entitlements - unless of course they are talking about gutting the military. Health care is a "superior good" which is employment intensive and consumed primarily by the elderly so with rising incomes and aging boomers, absent a breakthrough in health care, the cost of health care is going to rise disproportionately to the general economy. "An honest debate would be that we need cuts everywhere. Absolutely everywhere, and in all parts of government." This is exactly the same fallacy that Cochrane is accusing Frank of... just as it's feasible to afford infrastructure by cutting mandatory spending, it's trivial to design a (politically unattainable) set of policies that result in both a sustainable debt/deficit and massive increases in discretionary spending just by cutting transfer payments. The fact is that American is an outlier in terms of government spending and revenue amongst otherwise comparable... this is in spite of paying about twice as much as we need to for health care. It's fine to argue that it's preferable to cut spending rather than raise revenue to make the long-term budget picture work, but it's a lot more laughable to say we "need" to do this than it is to say we "need" to raise taxes to build roads. Always not mentioned in right-wing circles: Where the federal spending goes. Rural states, and zip codes. The NYT also ran a map, that Cochrame did not dupe. The Tax Foundation has done studies that illustrate that Rural America is basically Pinksville. Rural states get back $1.50 or more for every dollar they send to DC. And the NYT map shows Rural America feasting on federal entitlement dole. I favor an amendment that no state subsidize other states, or roughly balance what states send to DC and what they get back. That would change the argument and for the better. I think balanced budgets would be possible. There is no more subsidized, molly-coddled, knock-kneed, enfeebled economy in the world than Rural America, and that is largely a GOP stronghold. But never a topic in right-wing circles. The federally subsidized roads, power systems, water systems, phone systems, airports, train stops, crops, and residents. Even tobacco, ethanol and bees are subsidized or mandated. FYI, this blog is not a "right wing circle," and I'm happy to decry all the spending in your last paragraph. 'FYI, this blog is not a "right wing circle,""
Illegitimati non carborundum. They will label as "right wing" anything that does not parrot the DNC's latest press releases. It is a mere flatus vocis, like fascist, and racist. It only means that you do not duckspeak. @Benjamin - @abir hits the nail on the head. When the government builds or repairs a highway in West Virginia, for instance the imbalance between taxes paid by the locals and the tax money spent their becomes obvious. West Virginia is a perfect example really. Those federally funded highways (and river depots) provide a passage for coal which is extracted from the state (at a net income loss for the state government by the way) in order to provide power for the rest of the nation. So, while the populace doesn't pay nearly as much in taxes as they receive in benefits it seems like a bit of a net win for the nation as a whole. Maybe it's just my lack of a sense of humour, but I don't see the hilarity in Frank's article. Is it such a hilarious notion to think that the welfare of individuals is driven as much by how they compare to their peers as by the absolute level of their consumption? I don't think it is, taking that view to the next step higher taxes on the richest are unlikely to have large effects on their welfare while extra government spending on roads would benefit everyone. I also don't see why roads and the poor should be left from the debate on taxes. If the public want better roads but don't want to cut government transfers then higher taxes on the rich are a plausible solution. "Is it such a hilarious notion to think that the welfare of individuals is driven as much by how they compare to their peers as by the absolute level of their consumption?" Hillarious no. It is the way barbarians trapped in zero sum societies always think. It is the logic of the crab basket. It is also a violation of the 10th commandment. t is immoral for governments to promote as a justification for anything. "I don't think it is, taking that view to the next step higher taxes on the richest are unlikely to have large effects on their welfare while extra government spending on roads would benefit everyone." You missed the real joke, the money does not go to roads, it goes to pad the budgets of hospital administrators. It is good to hear someone say so forthrightly where the money is going. Not that this is a big mystery, its just that entitlement programs in general are the classic "third wheel" indeed - discuss or touch them, and you'll get burned! The fact remains that there ARE things only the Federal government can and should do - defense for example. Indeed, one could argue that one of the great technical leaps of the past 50 years - the internet - only came about through the Federal Government, i.e. DARPA. The government also has driven GPS. When you think about economic drivers, no one could argue the massive role these inventions have played in our economy. However, one must ask frankly, to what extent increasingly large transfer payments from younger workers to older retirees is truly driving economic growth and innovation? It would be great to see the Government divert just a small fraction of its transfer payments to alternative investments in advanced R&D for example. It could easily be argued that these massive transfer payments simply do not contribute to increasing productivity the way Federally funded R&D in science and technology do (is not of of America's advantages the unique nexus between its cutting edge research universities and the Federal Government). I am a Brit living in the States the past couple of years, but as an outsider I have seen very few of your politicians with the exception of Paul Ryan really propose to address these overall issues. "It would be great to see the Government divert just a small fraction of its transfer payments to alternative investments in advanced R&D for example." Welfare for white people. Besides after frying billions on junk like Solyndra, why should we think that there is anything there except your desperate wish to run an industrial society on rainbows and unicorn kisses. 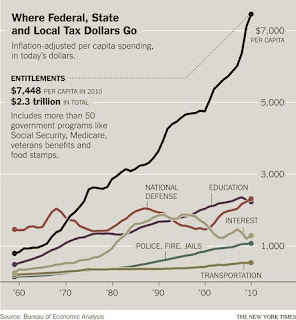 It seems to me that this graph combines two very different types of "entitlements" into one number. The first is Social Security retirement benefits that are proportional to one's past contributions. That's more like forced saving than middle-class welfare. Of course, taking that out would still leave a huge amount of middle-class welfare. But my point is that making people write checks to their future selves is different than making rich people write checks to pay for the health care of middle-class people. no, only if those payments had really been invested. Your logic only works when people are paid back their savings. Given that the SS funds are estimated to run out, it is just extortion from today's workers to the retired, as Randy comments below. Social Security is not people writing checks to their future selves. Social security represents today's workers writing checks to the retired. Today's workers have to rely on payments from future workers once they are retired for their benefits. Re "(Frank's article is hilarious in another way. Higher taxes are fine, he says, because more money won't make you feel better when everyone around you is wealthier too. Too much low-hanging fruit there, just go read it and have a laugh. Or shake your head in amazement. No, he's not joking.)" I recall a Campbell-Cochrane article with a "Keeping up with the Joneses" utility function which has that laughable characteristic: Your satisfaction for a given level of consumption is lower, the higher your subsistence (aspiration?) level is, and that in turn varies roughly with the general (neighbours'?) income level. Okay, if you say you are not in the right-wing circle, then I retract my statement. But really, are we going to start to see regular posts from you on ethanol, or perhaps the $2 billion per copy B2 bomber (which, according to federal government stats, each hour of B-2 flight necessitates 119 hours of maintenance. A federal government hangar queen), or the fact that military outlays doubled after 9/11 (in real terms), and never went back to pre-9/11 levels? How about the fact that some federal employees can retire after just 20 years of service, on full pension and lifetime medical care? Arthur Andersen called it a million-dollar pension, and that was year back. Uniformed federal employees--off-limits for any GOP'er. In brief, what I find is that GOP is not against government spending or intrusion into markets---just against government spending or intrusion into markets of the kind that does not favor their campaign backers or partisan supporters. The data from the Tax Foundation make it clear---The Red State Socialist Empire is a major drag on the federal budget, while blue states are net contributors to the federal budget. That is why I was disappointed you did not run the map that showed rural areas sucking down entitlements. Living on federal lard is a rural tradition steeped in glory. Oddly enough, if we could kick red states out of the union, we will have federal surpluses. I can understand your frustration with the large military spending as well as many other products (the red state socialist empire as you call it) of the over 100 year stranglehold that the old democratic party had on many of the rural states. But it is unlikely that much of it will be cut on either side of aisle. Look closely and you will see that if Texas 'went', even though she only loses about 5 cents on the dollar, that's over a $7 billion loss to the federal government. And when the federal government shifts military production from there to 'bluer' states, you are looking at a bigger figure. LAL-You are the first commenter I have ever read who understands the roots of Rural Pink America--LBJ and FDR. Since then rural areas have become GOP, but the lard kept flowing, more every year. Today, Rural America would blow away without federal dollars. You make a good point about Defense, but at this point Defense is parasitic coprolite, and we can probably cut spending by 80 percent and be safer yet. And yes, we need serious cuts in Medicare, deep and serious. The kind that only acceptance of intelligent euthanasia will accomplish. And wipe out the USDA. What is sad is that the GOP will never talk about these issues, and neither will the Dems. Cochrane? We will see. So far, he has repeated GOP commentary, but he says he is not in the circle. "Evolutionary Efficiency and Happiness", mimeo 2004. So please John, don't treat Frank's general idea as laughably obviously wrong. Becker's not an idiot. None of the very successful economists above are idiots. The editors of the AER and QJE aren't idiots. So if positional/context/prestige externalites are insignificant factors in peoples' utility we're going to need your evidence for that. For me personally, I'd be stunned if position/rank/context/prestige were insignificant factors in how much utility people get from clothes, cars, homes, etc., if the utility a person gets from a given house or car is not significantly different if it's in the 90th percentile or the 10th. I would be at a complete loss to explain all that I've seen, read, and experienced, day by day, in 48 years in this world. It would be hard for me to think of any alternative hypothesis that would fit it. But I'm very open to your evidence, and very curious to hear it. Not sure how this graph lets anyone draw conclusions about proper taxation policy (or much of anything else, really). I certainly don't look at these pictures and say "yep, the conversation about taxation to pay for bridges and poverty relief is now officially over". A lot of information missing in this picture. For one, a lot of the growth in entitlements is due to the fact that we have an aging population and rising health care costs. It would be nice to see that massive category broken down. We've also seen losses in manufacturing which have drastically reduced the earnings potential of many workers (e.g. GM's flight from Detroit in the 80's). Not a lot of wage data in those pictures... nothing on changes in the distribution of wealth. under-funding these things less over time is certainly not the signal that we need to stop the spending increases. Maybe there is an issue with waste or efficiency and we're simply paying more for less - hard to tell from a line that goes up over time. If a series of complicated rules and tax breaks has slowly shifted entitlement spending towards the wealthy, then a simple tax increase on the wealthy would be an easy way to reverse that trend. Of course, better yet, we could just simplify taxation and spending so that things are more transparent. These are complicated issues - these 2 graphs don't come close to addressing them in a serious way. Aside from positional externalities, as a liberal (mostly), and utilitarian (at least more or less), I'll add that we care about a lot more than just high social return public investment and aid to the poor. In today's world social insurance is absolutely crucial. I honestly don't know if you come close to understanding that with your lifetime super high paying job, and what must have been a completely secure life at the top at least from college, given that you made tenure at Chicago. Do you realize how incredibly risky peoples' lives are today? How common tragedy and ruin is for families, bankruptcy, foreclosure, severe illness with no health insurance, severe illness for a child with no health insurance, losing a $70,000 college degreed job at age 50 when you've grown accustomed to that wage, and now you'll likely never getting a job again that pays anywhere close to that, having to settle for a $25,000 job after two years of unemployment because with age discrimination (or just dispreference/disability) that's likely the best you can get now and for the rest of your life? I wish you could at least look through "The Great Risk Shift" from Yale political scientist Jacob Hacker. The government in many important cases has some enormous advantages in insurance – It's more reliable than any private company could ever be. It can have enormous economies of scale, and economies of simplicity. And when asymmetric information is severe, and very dangerous, there's actually an advantage that the government's incentive is not profit, but to please the voters and get re-elected. Government insurance can massively, profoundly increase total societal utils. Now, if you're very libertarian, you may still not want to give up even a little personal liberty for this, but as a utilitarian, and especially one who knows what it's like to have a family depend on him, I'm very happy to give up some freedom to spend my income for this. Just finished reading "The Great Risk Shift", and thought it was great. And you bring up a great point that I think should be emphasized. Most of what we call ‘entitlement’ spending replaces what we might spend in the private market on health insurance or annuities. To me, whether we call this spending “taxes” or “premiums” matters less than whether or not we are getting a good value for our money. We can debate whether the government or the private market provides these services more efficiently (There is evidence, some of it covered in “The Great Risk Shift”, that suggests governments can. They can use their power to tax to compel citizen to pay for these products, eliminating the problem of adverse selection, which eliminates the cost of having to underwrite each individual subscriber. ), but if ‘entitlements’ are just services purchased and consumed by the middle class (which is absolutely true for Social Security, and is mostly true for Medicare (about 42% is funded by general revenue http://www.kff.org/medicare/upload/7731-03.pdf). ), then I think they can be fairly ignored when discussing marginal changes in the income tax. Those taxes are, by and large, used to finance those parts of the budget MS. Warren spoke of. Also if you consider that the Social Security payroll tax has been collecting surpluses for the last 30 plus years which have mostly gone towards financing tax cuts for the very rich, I think it’s also fair to tell the rich to shut their pie-holes and pay their taxes, because we can’t afford to keep rolling over their debt anymore. It has taken decades to grow entitlement programs. Insolvency will speed their end. Given that social/entitlement spending is largely mandatory, insufficient revenue of the past several years has been offset (to the degree that it's been offset at all) by cuts, particularly at the state and local levels, in exactly the areas that you quote Frank fretting about. This is reflected in your graph by declines in education spending and stagnant spending on transportation and police/fire/jails, 2007-2010. It's reflected in declining public employment. Perhaps Frank would be more accurate if he said that these things required funds that could come from taxes, debt, or reduced social and/or defense spending, but they're disappearing and they're doing so because the money's not there. 1. The use of a linear axis is typical for newspapers but misleading. Transfer payments have grown only 30% faster than other government spending since 1929 despite massive expansions of social welfare programs. Growth rates for both have been almost the same since the early 80s. That chart is also short on total government spending by 25% or so. 2. Some entitlement spending is effectively spending on defense, fire, education and police workers, who would demand higher salaries absent state benefits. 1980 is the real joke. I call it Team Republican. The leisure class ballooned and industry collapsed. We even have a worthless education class. People like John Cochran get paid heaps of cash to teach, what a Master in Business? What is that copy and paste Black Scholes to loot the world. Foreign talent is the only thing holding the remainder of our economy of science and technology together because all princelings can't do math or science. Porter, Teisberg and many others wrote whole books with every imaginable option to workout the cost of health care. Team Republicans response was to impeach Clinton, to give us Medicare Part D, and essentially go to war against reason. What is that spike in 2000? Did we really need to pander to Citrus County and all the other leisure class, slums in Florida?